A group of 'biohackers' in Germany has implanted LED lights under their skin. 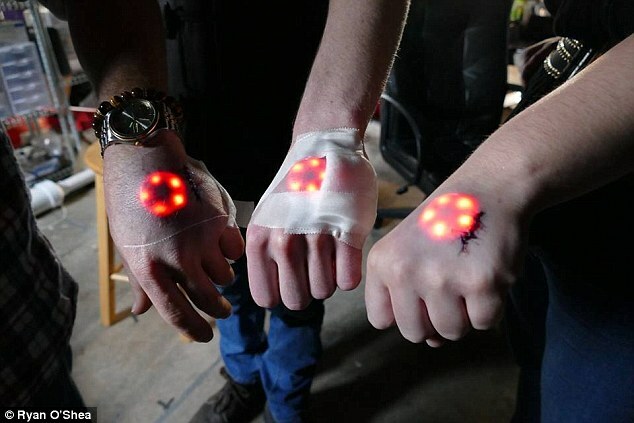 The men each had a Northstar V1 chip - which is about the size of a large coin - implanted into their hands. The chip features a ring of LED lights and is designed to be able to light up tattoos from beneath the skin, emulating the bioluminescence of jellyfish. The 15 minute surgical procedure was offered by Pittsburgh-based Grindhouse Wetware which claims to use 'safe' technology to create cyborgs. It was carried out by Swedish tattoo artist, Jowan Österlund, over the weekend at the German city's Cyborg Fair. Tim Cannon created the chip and was one of the men to have the implant. He did a similar thing two years ago, when he implanted the Circadia 1.0 computer chip – which is about the size of a cigarette packet – into his body. The sensor could connect wirelessly over Bluetooth to any Android device, produce readouts of the temperature changes, and send Cannon a text message. Motherboard's Anna Neifer asked Shawn Sarver, one of the biohackers,why his team developed the device. 'You know, people from the biohacking community wanted it,' he said. The latest device is made from a printed circuit board with five red LEDs in a circle, which are activated for ten seconds when a magnet comes close to the sensor. The device is powered is covered in silicone and powered by a 3 volt battery. This is enough power for the device to light up 10,000 times before the batteries die out and can no longer be recharged. The implant is expected to hit the market next year. The start-up is now working on a Northstar Version 2 which they say will include Bluetooth connectivity. This could give people the ability to make hand movements that would be wirelessly relayed to a receiving device that would control gadgets, such as a TV. 'Everyone is excited about how small the Northstar V1 is, because the last implant I had was the size of a pack of cigarettes,' Cannon told Motherboard.